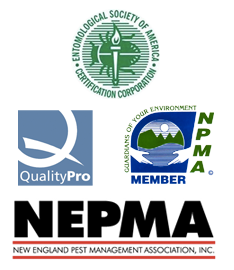 Our wildlife management professionals at Minuteman Pest Control are Massachusetts certified problem animal control [PAC] agents. They have had extensive training in humane handling, capture techniques, animal welfare, diseases and parasites, and follow all Massachusetts statutes and regulations. A problem arises when a nest is established in an attic area or between wall voids. Flying squirrels will typically enter the attic or between the walls via louver vents, sides of dormer windows, where telephone and electrical cables enter the building, ridge peak areas, and loose flashing around chimneys. Flying squirrels will typically establish a specific latrine and/or bathroom area. Once determined, this area will consistently be used over and over again causing a build up of both feces and urine. Usually this area tends to be found in the gable end of residential attics. Once a den site has been established you’ll know it. Squirrels can be heard running in between floors. Raccoons or â€œcoonsâ€ are nocturnal by choice. Mostly active at night but on occasion will be seen during the daytime. Its diet consists of crayfish, insects, mussels, fish, fruit, nuts, seeds, and corn. Raccoons are active throughout the year however will remain in their dens during inclement weather. Mating season begins in late January, February or March. After a gestation period of approximately 63 days a litter of three to seven young are born. The family group is very sociable and will remain together throughout the summer months and may den together during the following winter. Raccoons will normally nest in hollow trees, logs, rock crevices, vacant buildings, beaver lodges and woodchuck burrows. Sometimes, however they become a nuisance when they tear up lawns, raid garbage cans; establish a den site in chimneys, attics, and hollow areas beneath buildings and porches. Raccoons will tear up or â€œroll backâ€ sod in lawns in search of worms and grubs causing extensive damage. The opossum is the only marsupial found in North America. Itâ€™s rather a primitive animal with a peanut-sized brain. Opossums will use their tails to hang from trees for short periods of time and will use its first toe for grasping. Mating begins in March with a possibility of two litters produced each year. After a gestation period of approximately thirteen days a litter of five to thirteen premature young are born. The young are weaned for approximately 75 to 85 days but usually will remain with their mothers for three to four months. Opossums are shy animals therefore prefer to feed at night. They are not territorial and may share roaming areas. Individual range may vary and is greatly dependent on the existing food supply. Some may cover an area as large as 1 to 2 miles and as small as ¼ of a mile. The opossum is considered both an omnivore as well as a scavenger. Its diet consists of insects, fruit, nuts, grain and on occasion road kill.